five lumbar vertebrae, known as L1 through L5. 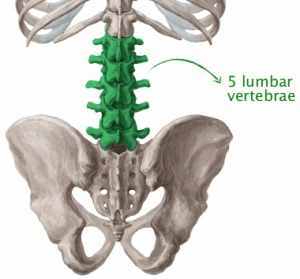 The lumbar vertebrae are located between the thoracic vertebrae and sacral vertebrae. sacrum, which is discussed above. between the spinal cord and the bony structure that surrounds it. above. Lumbar comes from the Latin word "lumbus" meaning "loin."